Poppy seed has a lovely nutty aroma and is a delicious baking ingredient, for example in poppy cake, poppy pastry and other sweets. Poppy seed plants grow up to 1.5 m, they belong to the Papaveraceae family and has been know for thousands of years. Poppy is grown in Turkey, the Czech Republic, Hungary and Australia, its origin is in the Mediterranean area. The steel-blue seeds in the capsules are a very popular foodstuff here. Poppy has it all: One of the highest calcium contents. In addition, potassium and magnesium and many B-vitamins. Multiple fatty acids in a particularly valuable combination for the body. 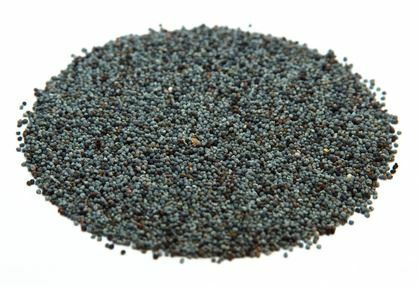 While the milky juice of the poppy plant is used to make opium, the morphine content of poppy seeds is extremely low and harmless. Gladly we’ll advise you in person. Call us during our opening hours (Mon. - Fri. 08.00 - 16.30 h) or send us an e-mail: info@zieler.de.